When Khiary Gray officially became a professional boxer in 2014, he never imagined he’d make it this far, so he kept a bucket list just in case he failed to reach his ultimate goal. One of the many items? Fight at The Theater at Madison Square Garden in New York City, the same venue where the late Arturo Gatti won his first title defense as the IBF World Super Featherweight Champion, where Roy Jones Jr., Hector Camacho and Larry Holmes once roamed, and where fellow Worcester, Mass., native Edwin Rodriguez captured the USBA Super Middleweight Title in 2012. The eight-round Gray-Evchenko bout is one of 11 scheduled on Saturday’s telecast of HBO’s World Championship Boxing, headlined by the 12-round WBO World Light Heavyweight Championship showdown between reigning title-holder Sergey Kovalev and challenger Igor Mikhalkin. Promoted by Main Events, Krusher Promotions and World of Boxing in association with EC Box Promotions, Saturday’s card also features the return of unbeaten New London, Conn., heavyweight Cassius Chaney, plus a WBA World Light Heavyweight Championship co-feature bout between champion Dmitry Bivol and challenger Sullivan Barrera. Gray’s fight won’t be televised, but it’s a major step in the right direction as he continues his campaign at 147 pounds following a successful welterweight debut in December via a majority decision win over Greg Jackson at Twin River Casino. Per usual, Gray’s camp didn’t hesitate when offered the chance of a lifetime to fight in New York City on the undercard of an HBO event. Gray enjoyed a brief taste of the network television spotlight in July of 2016 when he faced Ian Green on the opening bout of Showtime’s ShoBox: The Next Generation telecast at Foxwoods Resort Casino, but the thrill was short-lived when Green handed Gray his first career loss via second-round knockout. Friends became distant and Gray’s inner-circle shrunk rapidly. At first, the 25-year-old struggled to deal with the ebbs and flows of being a professional athlete. He lost two of his next three after the setback against Green and faced a major career crossroad entering his December bout against Jackson. “That fight was a do-or-die fight for me. I had to prove that I could still make it,” Gray said. Had he lost, he admits he and his team would’ve had to think long and hard about his future in the sport, whether that meant moving back up to 154 pounds or quitting altogether. Instead, Gray rediscovered some of the magic that guided him to a 13-0 start and out-boxed the slick, rangy Jackson, doing just enough to get the nod on two of three judges’ scorecards. Not only did the win restore his confidence, but the relatively easy weight-cut that accompanied his training camp gave him peace of mind knowing he can fight at welterweight without sacrificing power or stamina. Outside of the ring, Gray learned to accept that not everyone who was initially along for the ride had his best interests in mind. 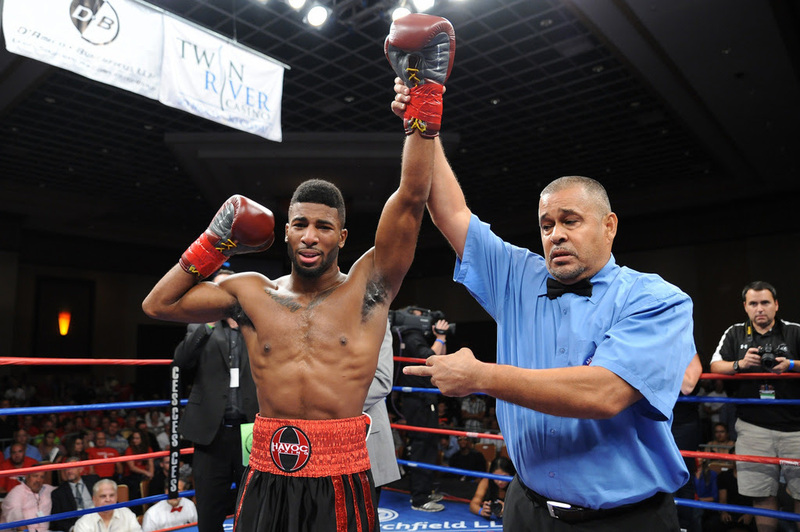 With help from his trainers, including former pro Sean Fitzgerald of Worcester, Gray prioritized the people who’ve been the most loyal and focused 100 percent on his craft, even quitting his overnight job to devote more time to boxing. “I actually blocked a lot of people off,” Gray said. “I cut a lot of people out of my circle, so it was actually just me and the people in the gym just focused on fighting. As he enters Saturday’s bout, Gray might be the most content both in and out of the ring as he’s been since he initially turned pro four years ago. He’s learned to deal with the setbacks – “Things happen for a reason,” he said – and focus on those who truly want to see him succeed. A win on Saturday on one of the sport’s most historic stages will go a long way toward ensuring his campaign in the welterweight division is the right move for his future in boxing. “This is perfect timing. This is exactly where I want to be at,” Gray said. Tickets range from $50.00 to $300.00 and are available through www.ticketmaster.com or the Madison Square Garden box office. The live HBO telecast begins at 10:05 p.m. ET.